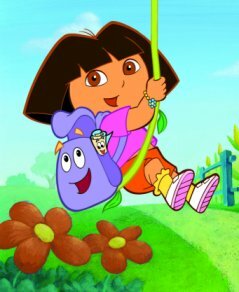 Mighty Myth Month: What's in the box, Dora? Pandora’s “box” is a modern invention going back only as far as Erasmus. According to Hesiod, the evils of all men were shut up in a storage jar (pithos) buried in the ground. This is connected by some with the Athenian festival of pithoigia, – when the great vats (pithoi) of new wine were opened. Perhaps that’s really where all mankind’s troubles spring from! [from wine, not Pandora] She, as the first woman, created after man, is sometimes compared to Eve in Hebrew myth. Pandora was originally a title of the goddess Rhea (the name means all gifts) – but the story of Pandora and her jar (not box) was probably an anti-feminine invention of the poet Hesiod. This is all about curiosity, or disobeying orders. It’s about how women cause trouble when they think for themselves, and keeping it all in a box, jar, back-pack, purse, pantry, or Rubbermaid storage container is where it should all stay. Taking the prize that’s offered. The brand-new, first woman on earth is given a box/jar, depending on which snooty professor’s of mythology version you want to believe. (I am always suspicious when anyone has the “definitive” translation of anything that’s over five minutes past–you can’t trust all communication; things get lost in translation.) Cut the girl a break! It was a GIFT! Her name means ALL GIFTS, for goodness sakes! What was she supposed to do? Return to sender? C’mon. So now we can conveniently blame ALL OF MANKIND’S TROUBLES ON GIRL’S DECISION TO OPEN A BOX?!?! Yeah. Well, I’m going to grab my keys, lipstick, and I’m outta here. 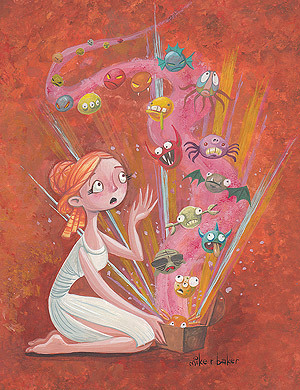 Previous Mighty Myth Month: Pixie Stix. Next Mighty Myth Month: Trees.